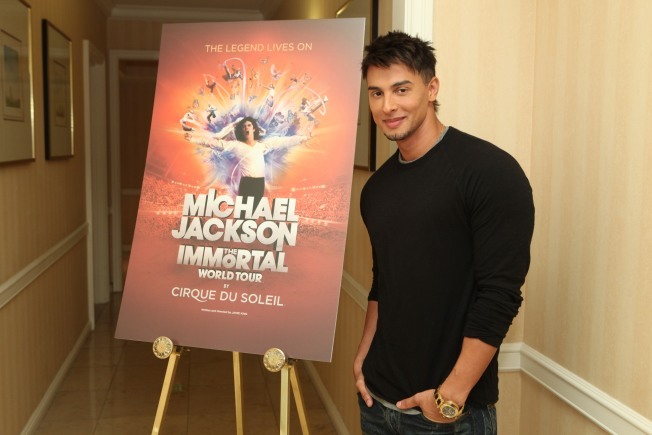 In this publicity image released by Cirque du Soleil, Jamie King, writer and director of "Michael Jackson The Immortal World Tour" by Cirque du Soleil, stands by a promotional poster, Wednesday, Nov. 3, 2010 in Los Angeles where the Estate of Michael Jackson and Cirque du Soleil announced the launch of the production combining Michael Jackson music and choreography with Cirque du Soleil performers. The tour begins in October 2011 in Montreal. The King of Pop’s show must go on. The first of acrobatic troupe Cirque du Soleil’s two planned Michael Jackson shows will be set in a stylized version of the singer's famed Southern California home, Neverland Ranch, according to Jamie King, writer and director of what Cirque is billing as "Michael Jackson, THE IMMORTAL World Tour." "It is really about a central character or characters who get transported into this world of Neverland where they learn everything there is to know about Michael," King, who has directed concert tours for Madonna, Rihanna and Celine Dion, told The Associated Press. The tour will kick off in Montreal next October and hit 30 cities including New York, Miami, Philadelphia, Los Angeles and Las Vegas. 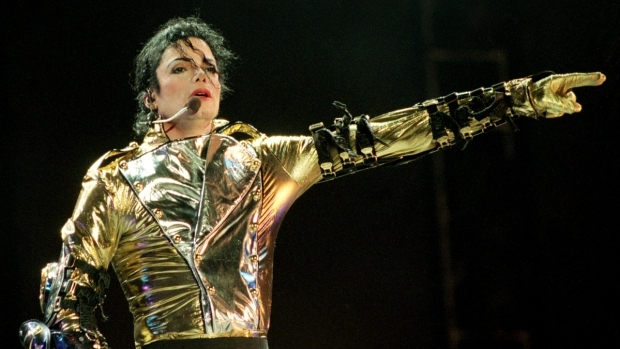 John Branca, co-executor of Jackson's estate, said that depending on fan response, it could be extended beyond its planned end in the summer of 2012 and travel outside of North America. 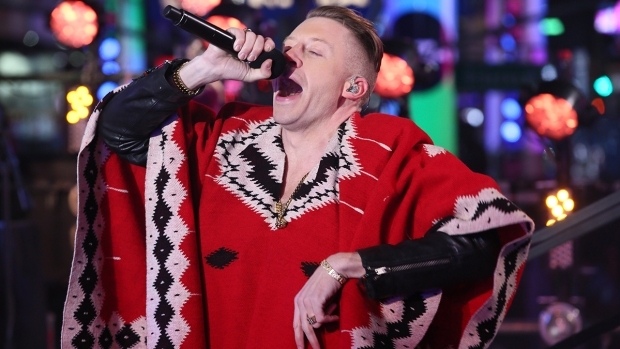 Excerpts from Jackson's music videos and extended scenes from last year's "This Is It" documentary will be part of the 90-minute show, but no performer will represent Jackson specifically. "Michael Jackson is throughout the entire show, but in no way am I going to use a stand-in," King said, adding that songs would include hits from "Thriller" to "Smooth Criminal," as well as new remixes like those made for Cirque's Beatles show, "Love." "Immortal" will also feature as-yet-unreleased songs that Jackson had finished before his death last year, including some from an album that the singer's estate hopes will go on sale by Christmas, Branca said. Concept art for the set prominently features a massive tree, which represents a favorite oak that sat outside Jackson's Neverland bedroom, King said. The singer nicknamed it the Giving Tree and had a perch built atop it where he wrote music and sometimes slept. "It made sense that that would be the perfect environment for us to create this world of magic, fairy tale," King said. "Because Neverland for Michael Jackson was his kind of his peace and his serenity. ... So after going to Neverland and really experiencing and feeling the beauty and the energy that was there, I had no choice but to create an environment that reflected that." King said he would begin auditions for about 60 dancers next week. Producers are hoping to hire dancers and musicians for the live band who have worked with Jackson, Branca said. Jackson admired the Canadian troupe's work and had attended Cirque shows in Los Angeles and Las Vegas. "He was always captivated and a fan of what Cirque does," Branca said. Cirque and the estate are also collaborating on a separate permanent production in Las Vegas in 2012 at a property owned by MGM Mirage Inc. They will each own 50 percent of both projects and share equally in the cost of putting on the productions. Cirque said "Immortal" would be its most expensive touring show ever, with a budget of $57 million. A select number of tickets are being sold to fan clubs of Michael Jackson and Cirque Du Soleil starting Wednesday. The rest go on sale Saturday.